(left to right) Joseph Graves, MD, ’16 GME, Teresa Mastin, PhD, director of Diversity and Inclusion, and John Franklin, MD, associate dean for Minority and Cultural Affairs. 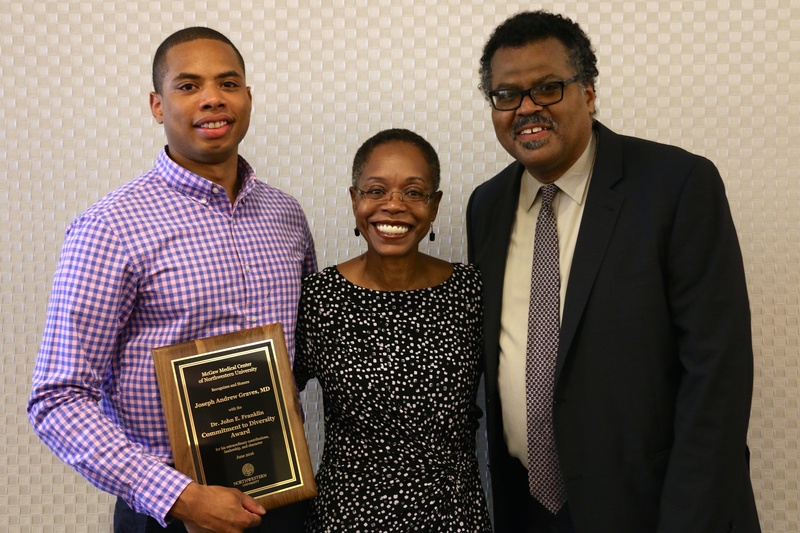 Joseph Graves, MD, ’16 GME, former co-chief resident in Radiology, received the John Franklin Commitment to Diversity award for his leadership and devotion to improving underrepresented minority diversity and mentorship at the McGaw Medical Center of Northwestern University. This year’s award was named after John Franklin, MD, associate dean for Minority and Cultural Affairs. “We appreciate John Franklin’s leadership and his work in pushing the mission of diversity and inclusion here at Northwestern,” said Joshua Goldstein, MD, ’02 GME, associate dean for Graduate Medical Education. This award, presented annually by McGaw and the Office of Diversity and Inclusion, recognized Graves for his participation in the residency showcase and the Student National Medical Association conference and for his involvement in the recruitment of underrepresented minorities in medicine. Graves will begin his fellowship in emergency and trauma imaging at Emory University in July. “I’m honored to have an award named after me. We have learned a lot about the benefits of diversity, but we still have a ways to go. People like Joe make our community and medicine better,” said Franklin, who is also a professor of Psychiatry and Behavioral Sciences.